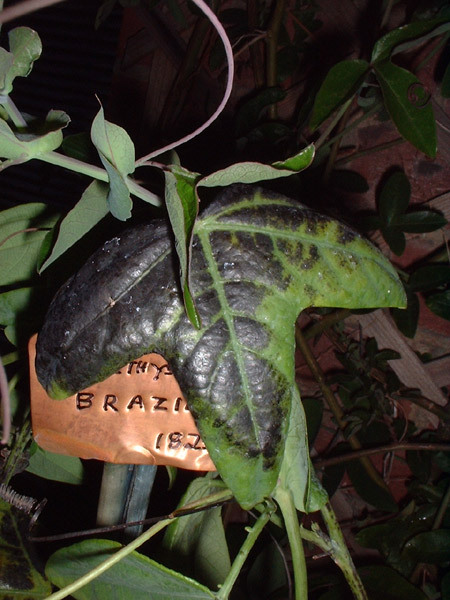 Black Disease indicates that a particular bit of tissue is dead but does not indicate that the plant itself will necessarily die. If its growing conditions improve the Black Disease will not travel further. It has also been observed on closely related species such as P. loefgrenii ‘Corupa’ and P. loefgrenii ‘Iporanga’. It can also be found on the hybrid offspring of these species such as P. amethystina x P.caerulea, P. ‘Purple Haze’, but the crossing considerably reduces the problem.